Anagen is the active growth stage of hair. During the anagen stage the hair contains its highest amount of melanin. This stage lasts between 2-6 years. Approximately 85% of all hairs are in this growing phase at any one time. Hair grows approximately 6 inches per year. The resting phase follows the catagen phase and normally lasts about 5-6 weeks. During this time the hair does not grow but stays attached to the follicle while the dermal papilla stays in a resting phase below. Approximately 10-15 percent of all hairs are in this phase at one time. 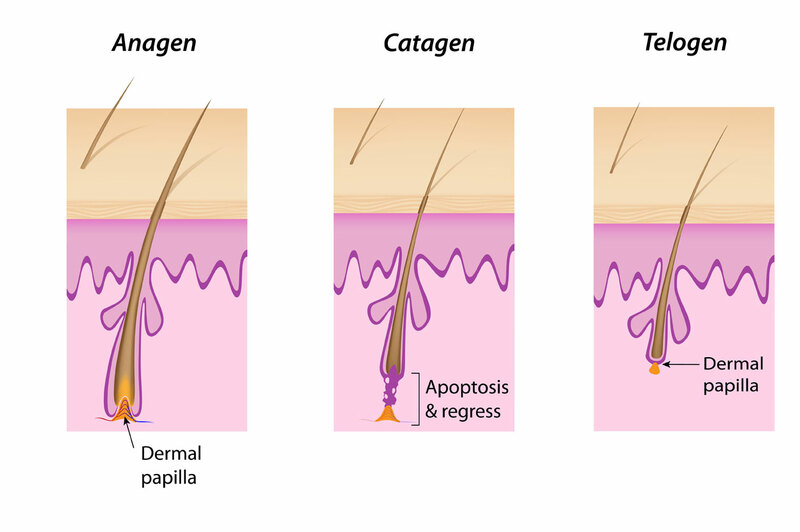 At the end of the telogen phase the hair follicle re-enters the anagen phase. The dermal papilla and the base of the follicle join together again and a new hair begins to form. If the old hair has not already been shed the new hair pushes the old one out and the growth cycle starts all over again. Each hair follicle is independent and goes through the growth cycle at different times; otherwise all your hair would fall out at once. Instead, you only shed a certain number of hairs a day – up to 100 hairs on a healthy head of hair.